We have previously demonstrated a new pyrometallurgical-based method to recover valuable metals from spent lithium-ion batteries. However, there was no in-depth work on the extraction of valuable metals from polymetallic alloy and manganese-rich slag obtained after smelting reduction. 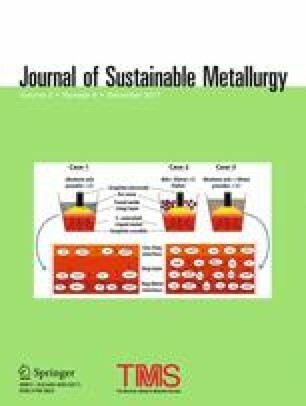 In this paper, two new technologies were investigated, with one combining converting, water atomization, and rusting-leaching of polymetallic alloy, and the other combining concentrated sulfuric acid leaching with roasting of smelter slag. The results show that 98.67% Cu, 99.84% Co, and 99.77% Ni were recovered by leaching the alloy powders in 120 g/L sulfuric acid at 90 °C for 8.0 h, and the solid-to-liquid ratio, agitation speed, and flow rate of oxygen gas are 100 g/L, 1500 rpm, and 0.15 L/min, respectively. Porous alloy powders were produced, which obviously increased the rusting-leaching speed under sulfuric acid media without adding any catalysts. Although only 44.30% of Mn and 50.28% of Li from manganese-rich slag were leached, purer leachate containing Mn and Li can be obtained by the method of co-roasting of manganese-rich slag and concentrated sulfuric acid. This means that the recovery of Mn and Li from the leachate can be directly carried out without any further purification process. The contributing editor for this article was S. Kitamura. This work was supported by the State-Owned Enterprise Electric Vehicle Industry Alliance (JS-211) and the Changsha Science and Technology Project (kq1602212). In addition, the authors are grateful to Dr. Yang Liu and Dr. Zhixue Yuan for revision of the English text.